Gifts, and gift giving, help us survive. Maybe not as much now, but human societies and gift giving have always been important to each other: giving and receiving gifts helps with interdependence, the feeling of "If I take care of you, maybe you'll take care of me". Whether it's hosting a party or giving someone change, it also helps the giver with a rush of generosity and kindness. But enough with the anthropological bit on gift-giving and interdependence. You want anime. So how does this tie in? Let's use two examples from two of the most-talked-about series this year: Attack on Titan, and Kill la Kill. First up: Mikasa Ackerman's scarf. We see Mikasa Ackerman's red scarf pretty much everywhere she is: she carries it into battle with her, and is rarely away from it. We do not know what it means: we only know that for some reason, she is very defensive and protective of Eren, the hotheaded boy who wants revenge on the strange Titans and who wants freedom - and will kick your arse. To the point that even other characters are afraid of her coming after them; she's a great fighter, and this makes her excel as part of the Survey Corps, but she is of few words. She is a red-scarved specter. And then we find out, in a flashback sequence, about the red scarf. Mikasa was deemed exotic, being as her mother was not a local; her family was attacked, with the idea that she and her mother would be sold into slavery. Her parents died; Eren knew of the family and had gotten himself involved, and with his help (and distraction) Mikasa survived. But at the end of it, Eren's father comes in to try and settle things; after all, what happened? Why are you holding a knife? Is the child Mikasa okay? It is freezing cold outside. A younger Mikasa and Eren. 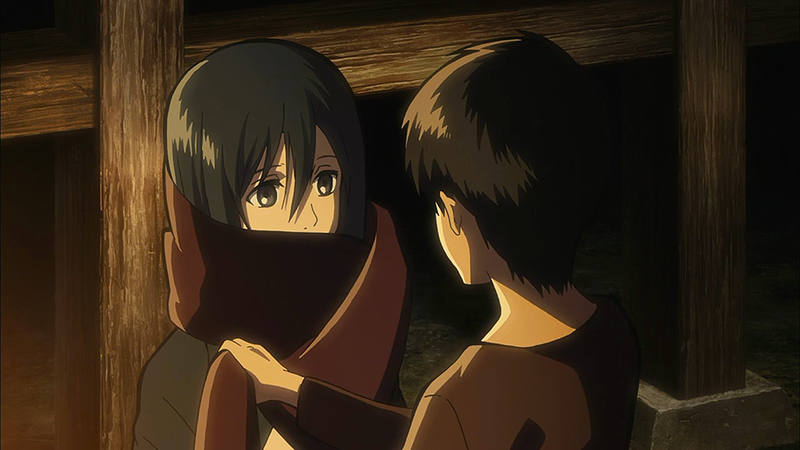 Eren gives a scarf to Mikasa, telling her things will be alright, that she's okay now. Someone is with her. Mikasa does not let it go. To her mind, the connection between them is fate and cemented in that red scarf: Eren helped her, so she will help Eren. There are no questions, just action about this; it is set in her mind. Mikasa survived; so must Eren. Somehow. A less extreme example of gift-giving and the unspoken connections about them is in Kill la Kill; any scene in which Satsuki is drinking tea. Her butler used to serve the Kiryuin family, apparently, but became Satsuki's personal servant instead of serving the family in general; he occasionally says something, but most of his role seems to be serving tea and making sure Satsuki can sit down every once in a while and enjoy it. Satsuki, in response, says about the tea: it was very bitter when she started drinking tea, but now, she enjoys it. Whether she's talking just about the tea, though, is a matter of interpretation (I think she clearly is NOT just talking about the tea) - you could easily say that after all that's happened to her as a child, she's grateful to have at least one person to make the time for her. Even if it's something as simple as making tea that she can allow herself to enjoy. In response, she has time to relax, compliments its making, and ruminates on the day. She might consider herself alone, but these small actions prove that she is not completely alone in her quest. 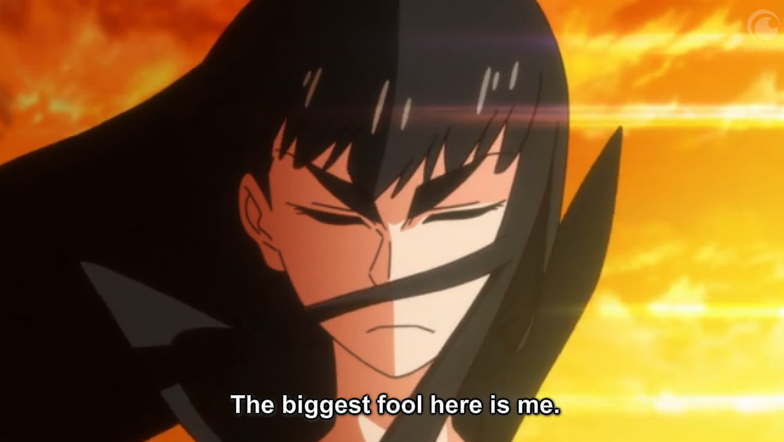 Satsuki in the midst of her apology. Of course, the scene in which Satsuki tries to display the most gratitude ever, and the idea of interdependence and life in gift-giving, is reflected in the scene where she bows to Ryuko (and the Mankanshoku family nearby). She has no thing to give, no uniforms or armor or weapons. But what she can give is not a material thing - she can give acknowledgment, humility, and kindness. She can offer interdependence done properly, which turns into "Let's work together to defeat this mother of ours." This holiday, we give gifts. Some of us don't have much to give, in terms of material things. But try and look for small things that might mean much to the giver, or to the giftee; in my case, being able to write this is such a gift. Do I have an impact on people? Maybe not, but as Charles just pointed out, Study of Anime would not be the same were I not here. And both of us would not be here doing these things were it not for readers, people listening to us at panels and getting inspired, and so on. This is the 200th post of Study of Anime, and without you it would not have been possible. Think about your gifts, and what you might be able to give to others. Survive. Rely on others, even if it's just a few people. Give yourself the freedom and luxury to do so, if you need. Merry Christmas, everyone, and a great New Year's.